When used effectively, tradeshow promotional products serve as valuable marketing tools to increase booth traffic and maximize results. Following are tips on how to use promotional giveaways to enhance impact, lead generation, and sales when you exhibit at shows. Choose trade show giveaways that will be valued by booth visitors – and something they want to keep long after the show is over. As you evaluate your options, determine whether the promotional products you are considering are something you would want to have yourself. If so, they will likely be something trade show attendees will find appealing. Preferably, the giveaways you select should have a connection to your business. For example, if you are selling computer-related products, an imprinted USB flash drive may be a logical choice. Or, if you are in the beauty supply business, consider giving away an emery board imprinted with your logo and contact information. Builders can hand out imprinted screwdrivers or tape measures. And, personalized pens that are quality made are appropriate for most every business. You can also select an all-purpose item, such as a tote bag, notepad or magnet, that has universal appeal. If you are using one of these often-used trade show giveaways, make yours distinctive by selecting the latest style, shape or color so your item stands out from the rest. Of course, your budget for tradeshow promotional products will dictate the type of giveaways you select. 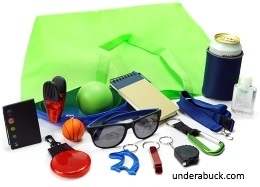 Contact a number of companies who specialize in promotional items and ask for advice. Tell the suppliers your budget, time frame for shipping, logo requirements and the quantity you need. Explain your exhibiting goals and ask for suggestions. Plan ahead to ensure you have plenty of time to receive your giveaways before you leave for the show. When placing your order, keep the information you want imprinted brief to enhance size and readability. Confirm turnaround time for your order. In addition, ask your promotional products company for a proof before the printing begins to ensure your company logo and contact information are large enough and easy to read. Attracting prospects and customers to your booth is a process that begins long before you arrive at your exhibition venue. Begin by making a list of your top prospects and customers whom you’d like to see at the event. A month before the show, begin a dialogue with them via phone, letter or email. If the number of people is a manageable, a personal phone call by you or a member of your team is the most impressive method of contact. Inform these high-priority individuals that you will be exhibiting at the upcoming event and hope to see them there. Give them your booth number and explain where your trade show display will be located in the conference hall. Then, invite them to come by your booth for a special promotional gift. If possible, establish a time when they will come by and make sure your booth is staffed appropriately so you can have a meaningful exchange and garner a sale. You may want to include information about your giveaway item on your website when you display your exhibiting calendar. The way in which you hand out your tradeshow promotional products influences their perceived value and impact. Consider keeping your supply of trade show giveaways out of site rather than having them on a display table for any passerby to take. Selectively hand out the imprinted products to booth visitors you've had to opportunity to speak with and who have expressed interest in your product or service. Remember that each person who stops at your exhibit display may be a potential buyer. You can also pre-qualify prospects by asking for a business card or having them complete a short lead "information" form before you hand out the promotional item. This will help identify your top prospects and assist with follow-up efforts when you are back at the office after the show. When you return from the event and conduct your post-show evaluation, consider the impact of your tradeshow promotional products, as part of your evaluation criteria. While quantitative results may not be available, you and your team will have strong directional cues on the effectiveness of the items you selected. This will help determine the type of giveaway to use in the future. In addition, you may want to test different imprinted products on different show days and/or different events to determine which are the most effective for your needs. Send extra giveaways to your customers who were unable to attend the show with a note telling them how much you value their business. Save extras for your next tradeshow event. Use your extra giveaways to collect leads on your website. Have information on your site that entices site visitors to complete your inquiry form to receive a gift in the mail (for as long as supplies last). For more information on tradeshow promotional products, click here.